Even weeds were beautiful yesterday with their coats of ice. Photo by Wendi Dunlap. 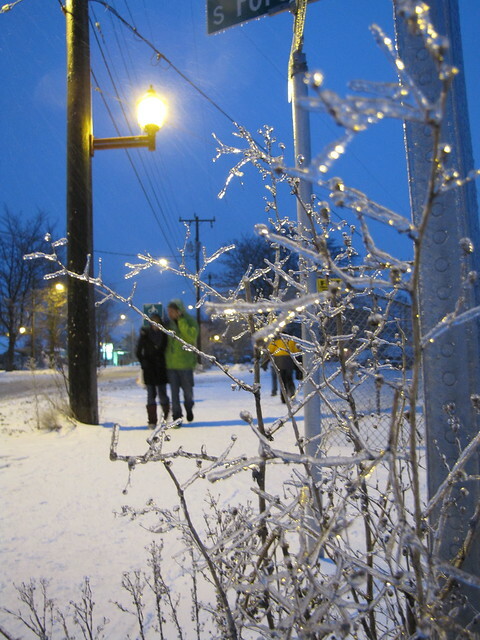 We saw a lot of folks sledding, snowboarding, and innertubing down steep South McClellan. Neighbor Cindy Vanous writes: "A few months ago, we had the 'remuddled' front and back porches of our 1923 Beacon Hill home removed and rebuilt according to the 1930’s census photo of the house. We also had new windows built in the same lovely style as the originals, and painted the whole thing to better show off the details… yesterday evening, it all paid off in one perfect photo. This is what I love about our hill: street after street of these beautiful Craftsman bungalows, still standing strong after earthquakes, windstorms, countless shifts in architectural fashion, and nearly a century of everyday use." In the snow, a street grate becomes abstract art. Photo by Robinette Struckel in the Beacon Hill Blog photo pool on Flickr. 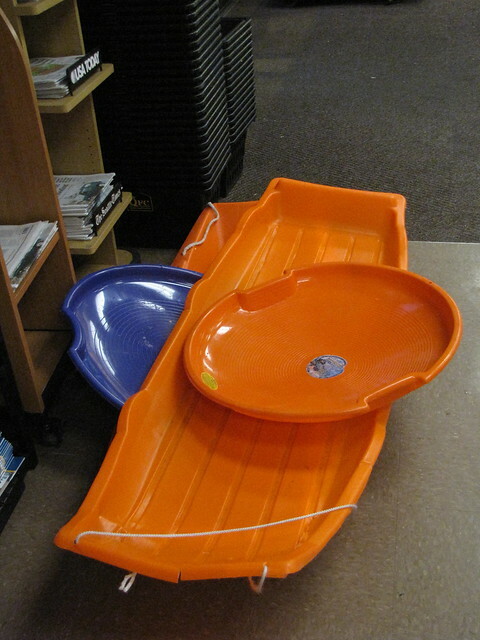 Shoppers parked their sleds and toboggans while shopping at the Rainier Avenue QFC. Photo by Wendi Dunlap. Follow along at beaconhillbungalow.blogspot.com as new Beacon Hill neighbors Laura and “Labor Foreman” (does that make her Laura Foreman?) utterly disassemble and then put back together a 1920 bungalow to their own design. They’ve been doing mostly demolition since getting started just over a month ago, and are now gearing up for rebuilding. Everything from plumbing to insulation to counter tops is just beginning to come together now. It saddens me a bit to see the house with so much original craftsmanship be completely gutted. Here’s hoping their plans are not only perfect for them, but are also well-suited to the bones and character of the house. 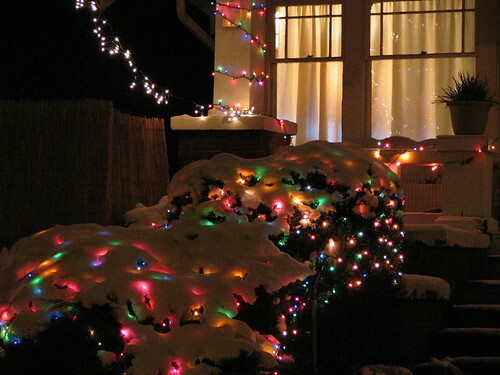 Holiday lights look so much prettier in the snow, don’t they? 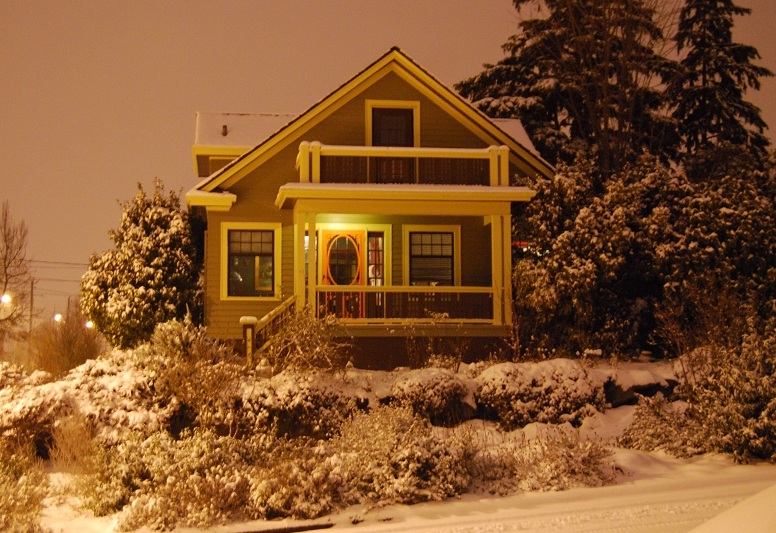 Here’s a cute little bungalow blanketed in snow and lights, on 16th Avenue South near the library. (Know of more? Email us. If you’ve taken photos you want us to feature, email them, or add them to the Beacon Hill Blog photo pool on Flickr. 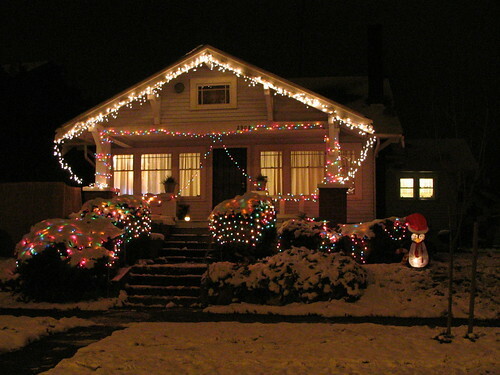 The lights are pretty through the snow! What are five things you love about Beacon Hill? 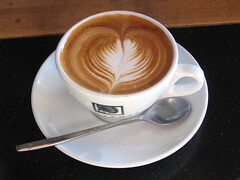 I love that I can get a cappuccino like this only 5 minutes' walk from home! Photo by Wendi. So I ask you all, what are the five things you love about Beacon Hill? Please post in the comments. If you have photos, please email them to us or put them in the Beacon Hill Blog photo pool at Flickr. The light rail that will be serving us in less than a year! The new library: beautiful, and full of the best things in the world: books! So what are your five? Next week I may ask for the five things you’d like to improve about the Hill, but for now, we’ll stay on the positive side.